The W♀Manchester Statue Project is about celebrating the significant role that women have played in the city. Until the unveiling of the Emmeline Pankhurst statue 16 out of the 17 statues in the City Centre were of men. The exception was Queen Victoria. The unveiling of this new statue will help address this inequality. All twenty women on the long list for consideration made a significant contribution to Manchester and, in many cases, to the country. This website aims to showcase these women and their achievements. From those twenty a shortlist was created and the public voted overwhelmingly for Emmeline Pankhurst. A shortlisting competition for the sculptor saw 5,850 members of the public vote for their favourite design. Hazel Reeves won the popular vote and was the unanimous choice of the selection panel with her ‘chair’ design: Rise Up Women. The statue was paid for without a single penny coming from public funds in Manchester. A limited edition of twelve 40 cm high versions of the bronze maquette were available for sale but have sold out. Corporate sponsors of the project were Property Alliance Group, Manchester Airport Group and the Government Equalities Office Centenary Cities Fund. In June 2015, the fundraising began with a 1,059 mile sponsored bike ride. The ride was in twenty day long stages, each devoted to one of the women on the long list. 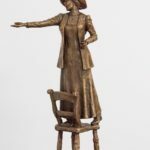 The six strong shortlist of sculptors have presented their ideas and following a public vote Hazel Reeves has secured the commission to create the Emmeline Pankhurst statue. 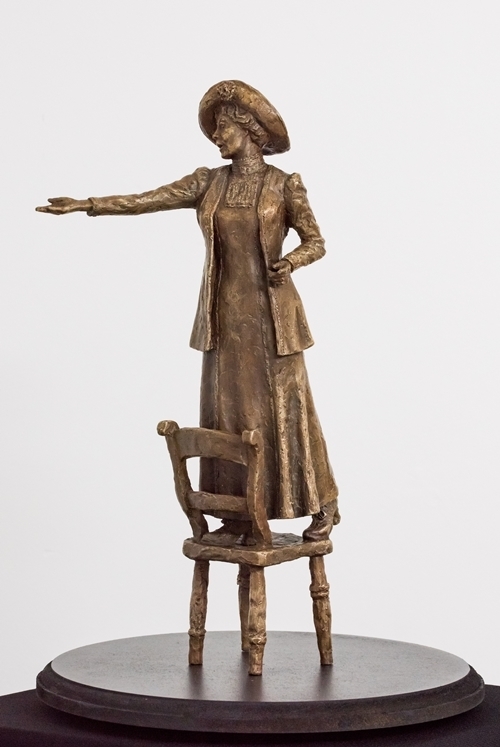 The statue was unveiled on Friday, 14th December 2018 – the 100th anniversary of some women voting for the first time in a British General Election.